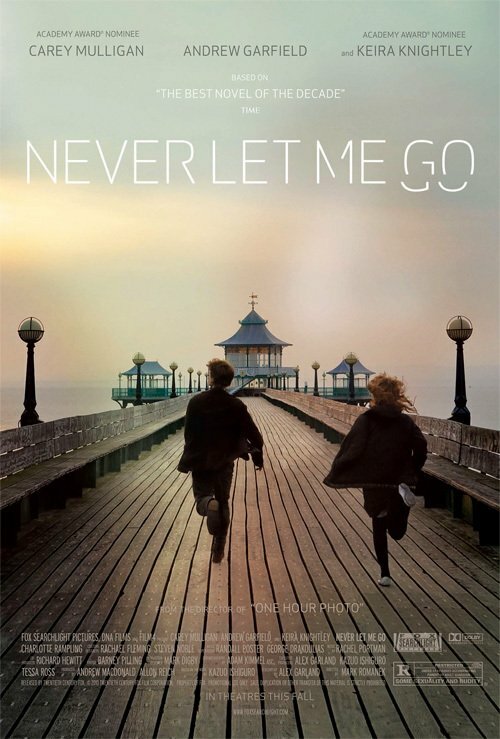 Never Let Me Go is a deeply sad movie, but no less enjoyable for it. That seems bizarre to say: “I thoroughly enjoyed being depressed for 100 minutes.” But when a film is so impeccably directed, with such nuanced performances, and such a moving score, you can’t help but enjoy it even if it does make you want to curl up in a little ball in the dark. Forever. Based on Kazuo Ishiguro’s novel of the same name, Never Let Me Go is a story told mostly in flashback by Kathy H (Carey Mulligan). After establishing Kathy in her late-20’s, observing a man being prepped for an unspecified medical operation, Kathy describes herself as a “carer” and begins her story as a child at a boarding school called Hailsham in a sort of alternate-universe late-1970’s. The school is very strict about personal health and limits the childrens’ activities. Surprisingly, almost no traditional education is depicted; the children don’t seem to ever learn science or mathematics or geography. Instead they spend most of their time at structured play or doing art projects. Bright and introverted, Kathy spends most of her time with Ruth (Keira Knightley), a rather self-absorbed and manipulative girl in her class. She soon befriends Tommy (Andrew Garfield), an outcast boy prone to violent emotional outbursts. Early in this part of the story, a new teacher reveals to the children (and the audience) that they will not have normal lives; they are clones specifically created to be organ donors, they are to begin donating when they reach their mid-to-late-20’s, and will continue to do so until they “complete,” usually within 3 or 4 donations. The next day, it is announced at the school assembly that this teacher is mysteriously no longer at Hailsham. As Kathy and Tommy expand their relationship into a very sweet schoolyard romance, Ruth swoops in and manipulates Tommy into a relationship that lasts well into their teens. Kathy is relegated to the proverbial friend-zone. At each stage of their lifecycle, Ruth’s & Tommy’s relationship continues to trouble Kathy, but it is her nature to quietly suffer through. Her interactions with Ruth become negative and hurtful, whereas her few times alone with Tommy are warm and respectful. The three inevitably go their separate ways. Kathy, now 29 years old, opts to become a carer, a clone whose donations are deferred so he or she can care for those who have begun their inevitable series of donations. The job weighs on her, but she perseveres and does what she can, eventually becoming quite capable and effective as a carer. By circumstance she encounters Ruth, now frail and in post-op recovery after a second donation. Ruth reveals that she has kept in touch with Tommy and insists that they all take a day trip to the beach. Having realized how wrong it was to keep them apart when they so clearly loved each other, she asks Kathy and Tommy for their forgiveness. The final act of the film centers around Kathy and Tommy chasing a rumor that clone couples who can prove that they are in love can petition for a deferment of further donations. I’ll stop here and not reveal the fruits of this quest. Director Mark Romanek doesn’t have many feature films under his belt. In fact, the only one listed on IMDb besides Never Let Me Go is One Hour Photo. (He is best known for his work in music video, having an impressive list on his resume including Nine Inch Nails’ “Closer” and “The Perfect Drug,” Johnny Cash’s cover of Nine Inch Nails’ “Hurt,” Beck’s “Devil’s Haircut,” and Jay-Z’s “99 Problems.”) In this film, he seems to have made a conscious decision to eschew the technological, sci-fi angle of this story, keeping things firmly rooted in the human element. And the movie is better for it. The main acts of the film are separated by title cards of various moody, pastel colors; each one representing the passage of time and a different stage in the characters’ lives. As stated above, it’s odd to have so enjoyed a film that is ultimately so depressing. But the story is beautiful, and beautifully told. I can’t help but recommend it.